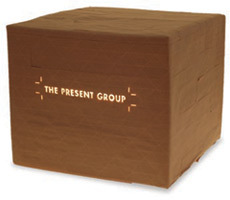 5 improvisations within the mundane to affirm the present moment by Aaron GM is The Present Group’s eighteenth piece. The edition of 100 usb drives contain an interactive video of Aaron performing in 5 locations within a domestic interior. Users may navigate through the 360 degree experience by moving their cursor back and forth and resting where ever they like. One way or another, Aaron GM’s work is about presence. When we first encountered his performances we took him to be lost in a single moment, repeating and playing with sounds and movements. They were reminiscent of the joyous and strange songs we find ourselves singing at the end of a long car trip, only in physical form. But in our interview with Aaron, he explained that he didn’t consider himself lost in his performances, but supremely present, internalizing and translating the environment into his own personal form of expression. Either way, his movements and use of language creates and invigorates the space and the public around him in a way that both challenges and invites the viewers in. Aaron GM (b. 1978 in Washington D.C.) lives and works in Los Angeles. He studied at both San Francisco Art Institute and UCLA. Recently he exhibited a solo presentation at the NADA Art fair in Miami Beach (2010). Other Recent solo exhibitions include capezio (2010) at ltd los angeles, Timeshares (2009) at Parker Jones Gallery in Los Angeles, and sales calls (2008) at Blanket Gallery in Vancouver. Aaron has shown in group exhibitions both nationally and internationally.